I have two sets of these versatile, durable pans; they get daily use in my kitchen. The large (13x18) one is the perfect size for storing the sliced turkey in the fridge and then reheating it in the oven. Love the lids for easy storage & stacking, too. This spatula is so versatile! Not only is it nice a long for transferring rows of turkey slices to a platter, but it also works great any time I need to flip something delicate that I'm sauteing. It can also be used as a whisk. A holiday meal stress buster! Roast and carve turkey in advance; reheat it to moist perfection. A holiday meal stress buster! Simple steps to cooking the turkey ahead of time and reheating it to moist perfection. After roasted turkey comes out of the oven, cover loosely with foil and let rest 30-45 minutes to allow juices to settle. Carve turkey, slicing the larger breast pieces into 3/4" thick slices. Arrange turkey slices and pieces on baking pan, with cut edges of breast slices pressed together to prevent them from drying out. Cover with plastic wrap, pressing it down onto the turkey to remove any air pockets. Cover entire pan with lid or aluminum foil. Refrigerate for up to 3 days. TO REHEAT: Remove pan of sliced turkey from refrigerator and rest at room temperature for 30 minutes. Remove lid and plastic wrap. Spread the slices out overlapping each one slightly, in an even layer in the pan. Drizzle broth over turkey. Cover with foil. FLASH REHEATING. Preheat oven to 450 degrees and heat covered pan of sliced turkey for approx. 7-15 minutes, or until turkey is heated through. STANDARD REHEATING. Preheat oven to 350 degrees and heat covered pan of sliced turkey for approx. 25-30 minutes, or until turkey is heated through. These reheating times are approximate. Ovens, pans, and depth of turkey can effect actual time required. Be careful not to over heat the turkey to avoid drying it out. 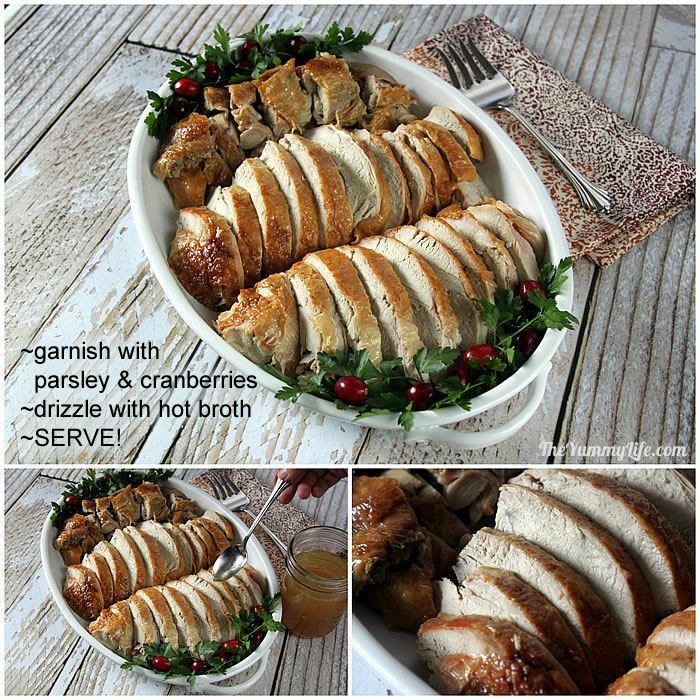 TO SERVE: Transfer heated turkey to serving platter. Drizzle hot broth left in bottom of cooking pan over platter of turkey. Garnish with parsley and cranberries, if desired. If it stresses you out to roast a turkey for a holiday meal on the same day it will be eaten, there's a simple solution: make it ahead. Goodbye stress. It takes time and attention to prep a turkey, roast it for several hours, let it rest, and carve it. You can do all that in advance, refrigerate it for 1-3 days, and all you have to do is heat it up when it's time to serve your turkey dinner. Oh, what a relief it is! Sure, you and your guests can't enjoy that delicious aroma of turkey roasting in the oven on the day of the big meal. But, maybe that's worth it if you can be more relaxed, have a more leisurely pace as you prepare the other parts of the meal and enjoy more time to visit with friends and family. This make-ahead turkey tastes amazingly yummy and moist. The only thing that is compromised is crispy skin. It softens when it's made ahead and refrigerated. It still tastes good, but it doesn't have that pleasing crunch from being freshly roasted. So, if crispy skin is really important to you, this make-ahead method may not be a good choice. For me, it's worth it to have a more relaxed day. Honestly, sometimes I'm so exhausted by the time we sit down for our holiday meal that I can hardly enjoy the food. That's why I've become such a make-ahead girl. I do as much as possible in the days leading up to a holiday meal. I also have make-ahead recipes for mashed potatoes, gravy, soft dinner rolls, and cornbread stuffing. With this make-ahead turkey added to the menu, my Thanksgiving or Christmas meals can be the most relaxed days of the year in my kitchen. Step 2. When the turkey comes out of the oven, cover it loosely with foil and let it rest for 30-45 minutes. This allows the juices to settle into the meat before it is cut. If you cut it too soon the juices will run out, resulting in a dry turkey. Step 3. Carve the turkey. I follow this great step-by-step photo tutorial from The Huffington Post: How to Carve a Turkey. Cut the turkey breast in 3/4" thick slices. 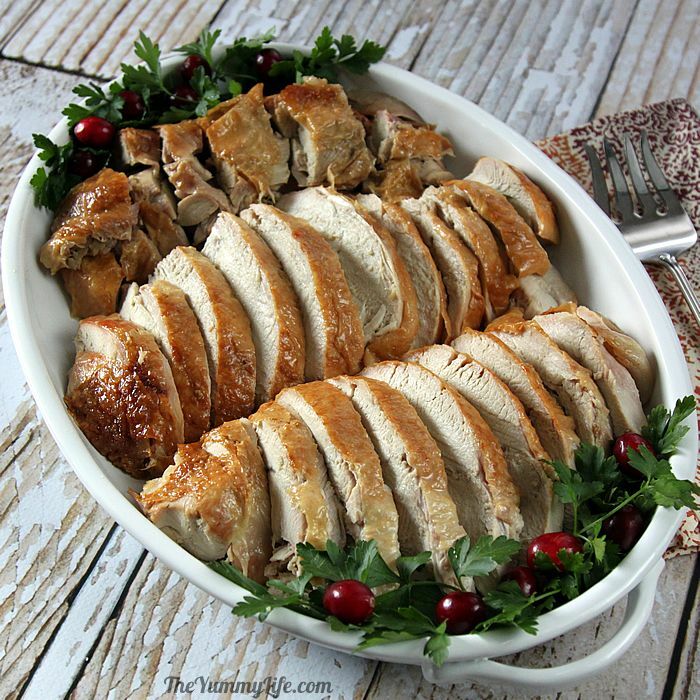 If you slice it too thinly, the turkey won't hold in the juices as well and remain as moist. Step 4. 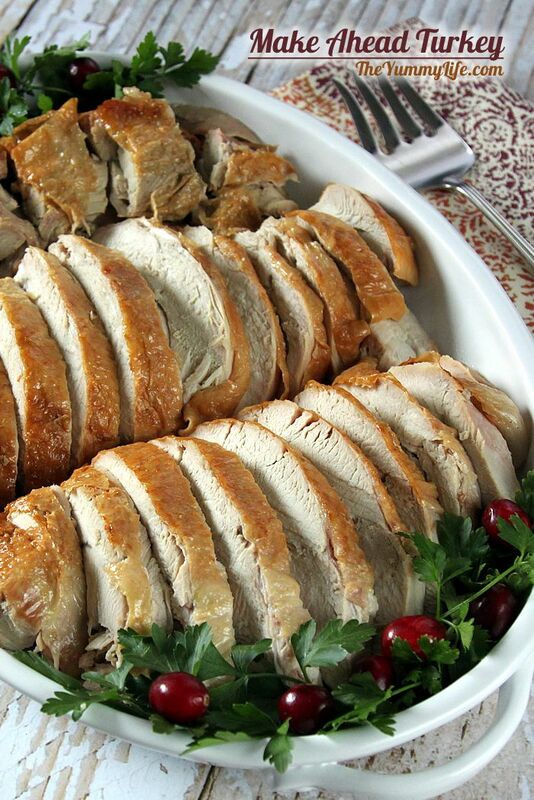 Place the sliced turkey in a baking pan that will fit in your refrigerator. Keep the sliced pieces pressed together. This helps the turkey retain it's moisture while it is in the refrigerator. Step 5. 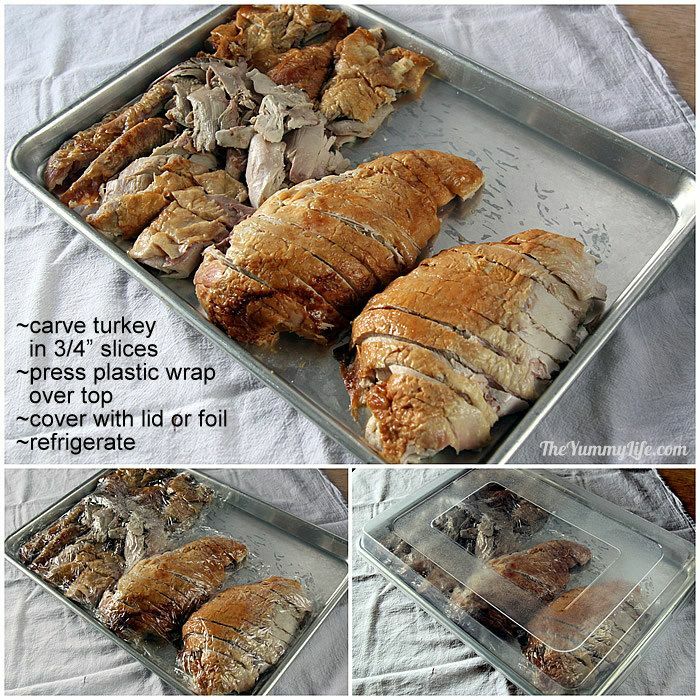 Cover the sliced turkey with plastic wrap, pressing it down to close any air pockets. This also helps retain moisture in the turkey. Here's how to reheat and serve the turkey. Step 8. 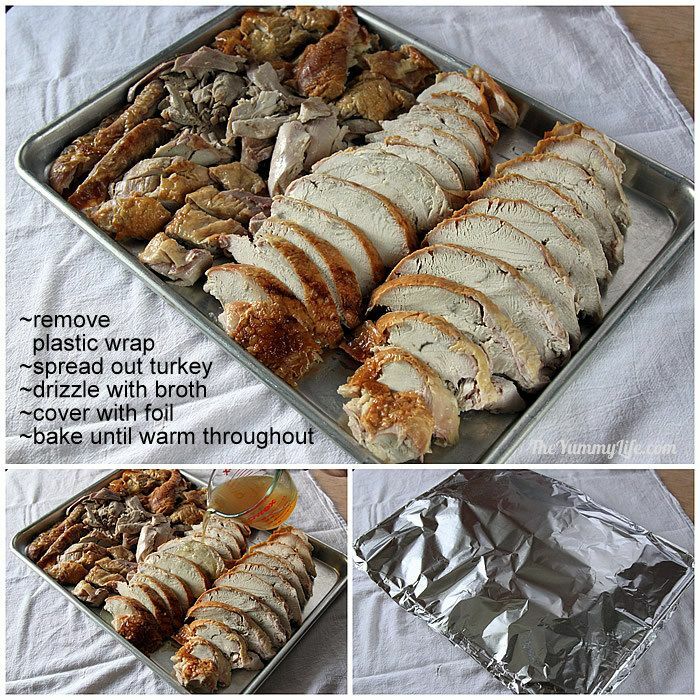 Remove the plastic wrap and spread out the turkey slices in an even layer. For quick, even heating, it's best to spread the slices in a single layer, overlapping them slightly--don't stack them if you can avoid it. Step 9. Drizzle chicken or turkey broth evenly over all of the sliced meat. You can use canned broth or make your own. It's easy to make a quick broth from the turkey neck and giblets that were inside the turkey before it was roasted. Check out my post: Quick & Easy Turkey Neck and Giblet Broth. Cover pan tightly with aluminum foil. Step 10. Reheat the turkey without overcooking it. If you've taken care to roast your turkey properly so that it has remained moist, you don't want to undo that by overcooking it and drying it out during the reheating process. There are two methods; choose the one that works best for you. With both methods, the turkey should be in an even shallow layer in a baking pan. If it's piled too high, the outside layers will overcook before the center layers are hot. FLASH REHEATING at a high temperature is a method often used by restaurants chefs. The concept is simple. Put room temperature food in shallow, covered pans, and put it in a 450 degree oven for approx. 7-15 minutes. It heats the food fast (in a FLASH) without cooking it further. This is the method I recommend if you don't need the oven set to a lower temperature for cooking other dishes at the same time. STANDARD REHEATING in a 350 degree oven is another option that normally will take 25-30 minutes for room temperature turkey to be heated through. This method is the best option if you have other dishes that need to cook in the oven at the same time at that temperature. Either way, the important thing is to remove the turkey from the oven as soon as it's heated through completely without letting it overcook. Ovens and cooking times can vary, so I recommend checking on it about half way into the reheating process to help you gauge when to remove it from the oven. Step 11. 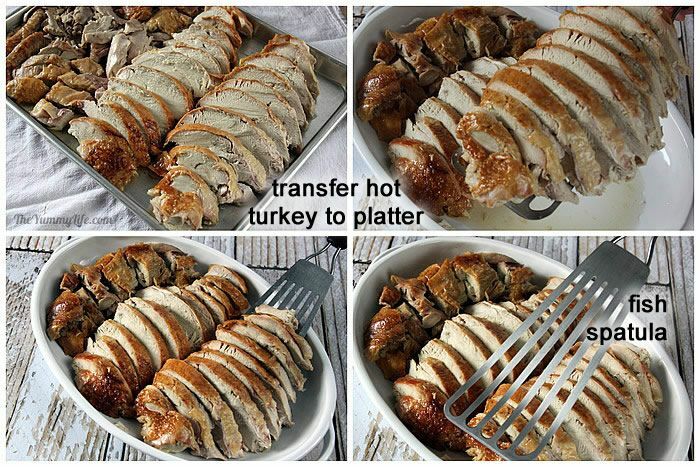 Transfer the hot turkey to a serving platter. I like to use a fish spatula for this--it's nice and long, so I can neatly transfer a whole row of turkey slices at once. Step 12. This is completely optional, but adding a little garnish can make a drab dish look like it came out of a magazine. I used some leftover flat leaf parsley and cranberries as a garnish--an easy way to make the platter look festive. Step 13. Drizzle 2-3 tablespoons of hot broth over the turkey just before serving. There should be some hot broth in the bottom of the reheating pan that can be used for this. Although making the turkey ahead takes just as much time to prepare, it requires very little time on the day of your holiday meal. Spreading out the cooking over several days and making as much ahead as possible are the best ways I know to have a low-stress, relaxing Thanksgiving or holiday meal.